Again a cluster of equal second place contenders here. Two non drivers make the cut – BK Motorsport’s Courage Mazda effort and Kevin Buckler’s Grand Am Pontiac GTO.R campaign. Another non rookie somehow makes the cut here, Marino Franchitti getting a mention for his efforts aboard Spyker and Panoz GT2 cars. Young guns at both ends of the grid are here too – Hayanari Shimoda’s searing pace in the guesting Zytek and Wolf Henzler’s efforts aboard the BAM! Porsche are both mentioned in dsc dispatches. The winner though stepped up to a near full season in prototypes and gained speed and confidence seemingly every time she took to the track. Brave too: when the Intersport Lola self-combusted at Road America she bailed out, but saw the car rolling back towards the track. Putting the safety of her fellow racers before her own she managed to stop the car by pushing against the rear wing, despite a growing fire. The dailysportscar.com Rookie of the Year 2005 for North America is Liz Halliday. 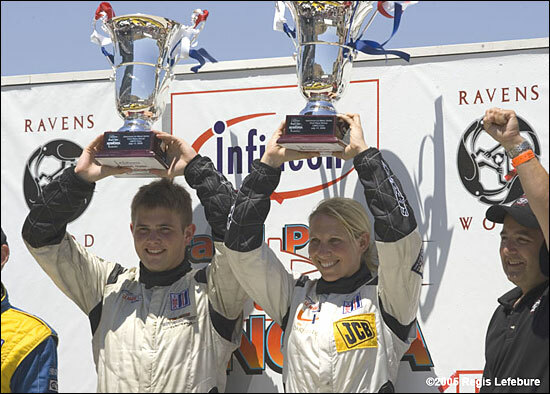 “Liz made Clint Field’s LMP2 win possible holding ‘best of the rest’ in race after race” – Tom Kjos.